The Extended Long Reach Notary Embosser comes with a lifetime warranty and is guaranteed to meet all state specifications for notary supplies. This is the ideal product for those notaries who need an even longer reach to emboss up to 4 1/2" in to the page. 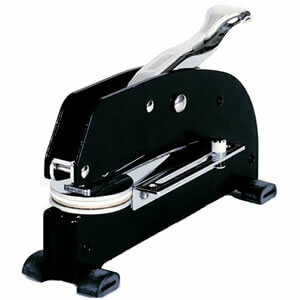 The Extended Long Reach Notary Embosser is our most heavy duty embosser. This tough seal embosser will suit your needs as it provides the same functionality as our standard desk stationary embosser yet adds an extended reach for up to 4-1/2" from the paper's edge. This unit is ideal for notaries in large offices who need the extra few inches of reach and that are required to notarize a high volume of documents daily. Depending on what you are notarizing, it can be tough to find a space where your seal will fit. Our Heavy Duty Extended Long Reach Notary Embosser is no match for extra finicky documents. This unit has the capability to create quality impression in the middle of an 8 1/2 x 11 page and can be used with paper up to 60 lbs! Aesthetically pleasing and easy to work with, you'll never have issues with this extended long reach notary seal.